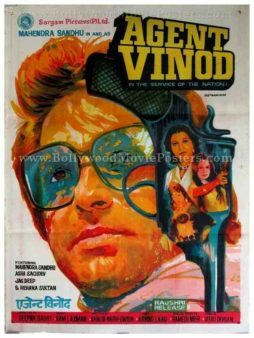 Rare hand painted Bollywood movie poster of the hit Hindi film Agent Vinod (1977) for sale. This is an actual surviving vintage publicity poster of the 1977 hit Hindi film, which featured Mahendra Sandhu and Asha Sachdev. This Bollywood action packed secret agent spy thriller was a surprise hit. The film was a loose adaptation of James Bond, with the lead protagonist playing a secret Indian agent. It inspired a recent (2012) Hindi film with the same name, making this poster highly collectible! 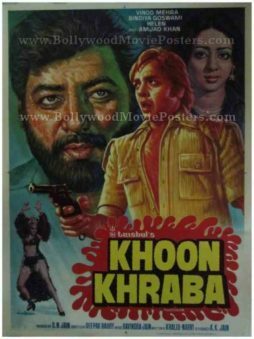 Printed and circulated a few years after the release of the film (somewhere in the late 1970s), this old hand painted Bollywood poster was originally designed for publicity of the film but never ended up being used. The poster features a large artistic hand drawn portrait of the lead actor on the left, wearing a very vintage spectacle frame. A large inverted pistol appears alongside his face, which contains the hand drawn portraits of three actresses from the film. Agent Vinod is a 1977 action packed Bollywood spy thriller starring Mahendra Sandhu in the lead role as an Indian secret agent.